What about your safety at the foot of the wall? Are you wearing a helmet? Do you make sure your children wear helmets? 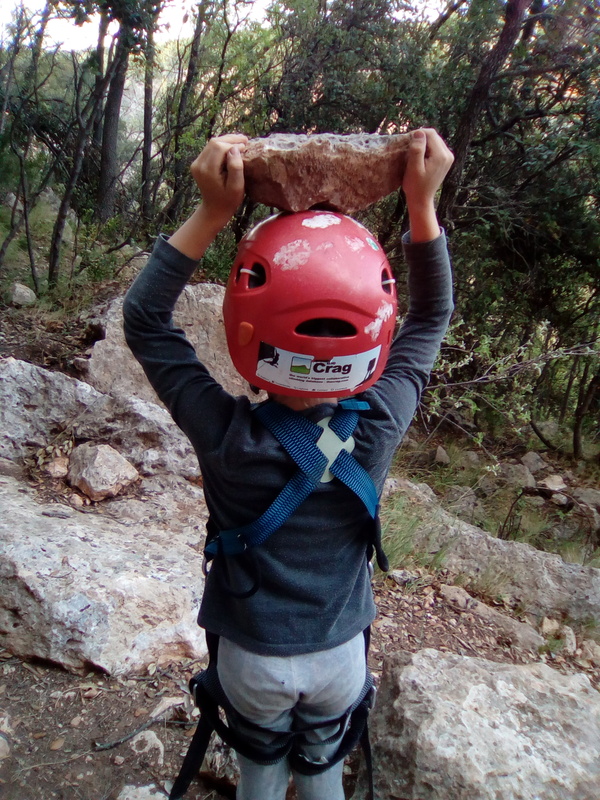 Do you regularly check if the children are outside the rockfall zone? Stones can also fall out of frequently climbed routes. Last week this stone fell out of a route in Central Park from a height of about 4m. 1m next to the one belaying – no chance to react. That was luck… We’ve seen children play there. Protect yourself and your family – be careful and wear a helmet. Now it is much easier to drive down the last curve to the Refugio. We widened and flattened the curve on both sides. Good ride! On 2nd April, lots of waste, that had been dumped, was collected in Sector Tubo by volunteers from the “MijaresVivo” and “Escalada Sostenible Alto Mijares” initiatives.